Museveni has other shirts that are not white. 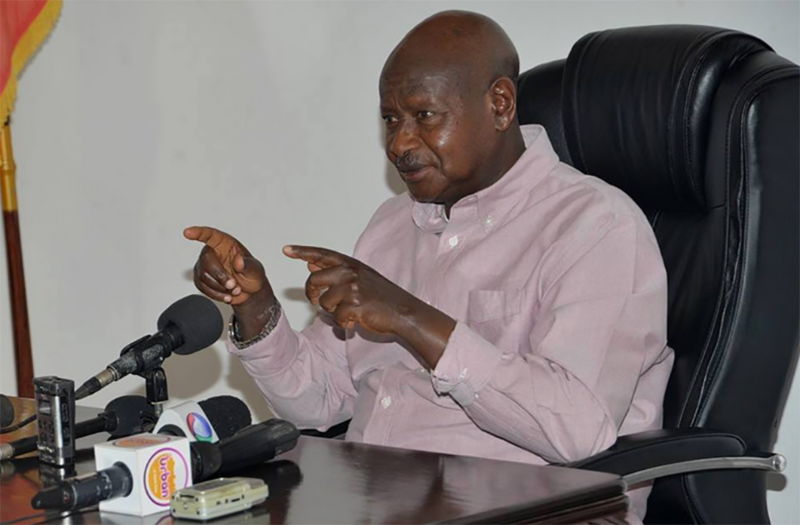 President Museveni has said that opposition imported illegal voters to Arua leading to the defeat of the NRM candidate in the Arua Municipality election. The election was won by Kassiano Wadri an independent candidate. Wadri is being detained in Gulu. In a statement issued earlier today, Museveni also emphasised that cases of “terrorism” against Kyadondo East MP, Robert Kyagulanyi aka Bobi Wine, shall continue. We are now investigating the allegations that some candidates had imported illegal voters from other areas to the municipality. The Opposition has been doing this repeatedly, such as in Jinja East and Bugiri Municipality. The NRM agents have got a weakness of not auditing the voters’ registers in time to discover these imported voters. In the case of Arua Municipality, there is an allegation that the illegal voters were brought to the attention of the Electoral Commission but that it did not pay heed. The cases of terrorism, damaging property, manslaughter etc against the Hons: Wadri, Bobi Wine, etc will continue. Their actions led to the death of a Ugandan, injury of a number of others and damage to property, so the allegations go. Processions through populated centres without co-ordination with the Police should never happen. I never organize processions. I always drive to and from the rally site in my convoy. Sometimes, only the boda boda riders join me.